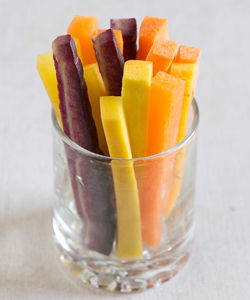 Colored carrots are all the rage. While not ubiquitous in grocery stores, farmers across the nation have begun featuring a mix of colors on stands over the past 10 years, with a dramatic increase in popularity more recently. Johnny's first began offering "not orange" carrots back in 2002, when Kinbi (a yellow Kuroda) and Nutri-Red were introduced. It was 2005 before our colors expanded into purple with the introduction of Cosmic Purple (very similar to Purple Haze, which we offer presently). Those first colored carrots on the market were interesting, but lacked many of the important characteristics of modern orange carrots that growers and consumers were used to. Their novelty made up for some of the variability and somewhat harsh flavors of those first commercial releases. The breeding work is fast catching up, though, and the colored carrot varieties of today are much more uniform, with flavors moving away from harshness and closer to "true carrot" flavor and sweetness. What's Behind Growing Interest in Multicolor Carrots? A range of carrot colors existed in the wild even before people began to cultivate this crop. In the past few years, however, "colors other than orange" have demanded an increasing share of the carrot stage. Several factors are likely contributing to the spike in demand, including mounting research and public awareness around the health benefits of richly pigmented fruits and vegetables. Trumping what's good for you, however, is sheer plate appeal. 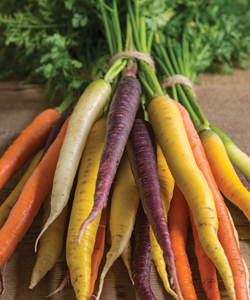 Not only do carrots now come in a palette that's eye-popping, but according to Dr. John Navazio, Johnny's Plant Breeder, "Colored carrots taste better than they used to." In recent colored carrot trials of both hybrid and open-pollinated varieties, he reports newer varieties to be superior to varieties from 10 years ago in 1) shape uniformity; 2) smoothness; 3) color; and, best of all — 4) flavor. "The flavor is consistently better now, and most were worth eating," John sums up. 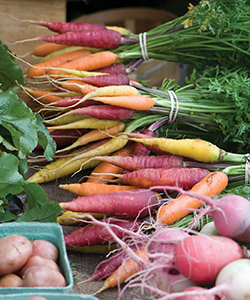 "All of these factors mean a more marketable carrot for direct market growers." Given that the very earliest carrots — cultivated over a thousand years ago — were purply-black, how did orange get to be the iconic color for carrots? It may be partly that carrot color and flavor are linked: early carrots that were more yellowy-orange contained a more palate-pleasing balance of the phytochemicals that govern carrot flavor. People selected and bred the orange ones for table use over those at the purple or red ends of the spectrum. The connection may be partly political as well. 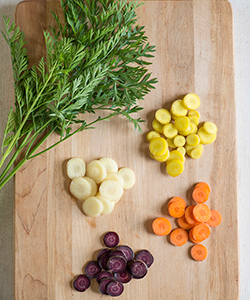 Historically, the Dutch are credited with experimenting and making various crosses with carrots of different colors: white, purple, yellow and orange. Around the time of the Dutch struggle for independence from Spain, the leader of the independence movement was William of Orange. 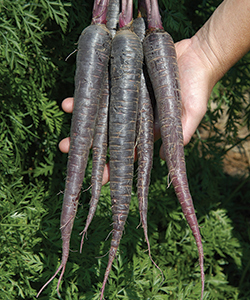 Lore has it that Dutch carrot breeders, in their patriotic fervor, purportedly bred only orange carrots, to the exclusion of white, purple, or yellow types. Getting back down to flavor, there are dozens of volatile flavor compounds in carrots, mostly from the group known as terpenoids. Varying types, relative amounts, and combinations of these terpenoids, together with sugars, are what give different carrot cultivars their unique aromas and flavors. Sweetness. Must be judged simply as the extent of perceived sweetness. Harshness. Generally excessive terpenoids, or a poor balance of certain terpenoids, can be harsh and unpleasant — or, as a fellow carrot expert calls it, some carrots taste "like a pinecone." True Carrot Flavor. This is the elusive combination of terpenoids that lie within a range most people view as "good," especially when combined with decent levels of sweetness. I also think of it as "rich carrot flavor." Off-Flavors. These are the terpenoid-based flavors outside of what some people consider good or true carrot flavor, and include the overly aromatic, "flowery" or "perfumy" taste. Even so, there are people who either don't mind it, tolerate it if the carrot is sweet, or, actually like it! It usually is most noticeable in the carrot varieties without a good strong rich flavor background. Just as different carrot cultivars vary at a molecular level, so, too, do their days to maturity. And, as growing conditions can vary, your carrot varieties may not always mature according to the numbers in the book. You'll want to sample them regularly as they grow, both for tip fill and optimal flavor, but also to watch for signs of bolting.
" 'Rainbow' carrot is a single variety that has color segregation. This is good in the sense that all of the colors mature at the same time. The drawback is that the color variation is limited to oranges, creams, and yellows — no red or purple. "So how does one manage the colorful carrot bunch displays? This is best achieved through succession plantings of individual varieties. Plant the later varieties, or those with higher days to-maturity, a week or so earlier, and in a separate block from the 'Rainbow' variety. Then harvest both around the same time." Everyone loves carrot bunches, but another way to display carrots is loose, so people can mix and match their own. This will mitigate some of the variability of shape and size in your multicolor carrot harvest. Another question we hear a lot is, "What do you have that will help me stand out at market?" When there are over a dozen farmers at a farmers' market, all offering staple crops, how do you differentiate yourself from the other growers? Why would a customer buy from you as opposed to your competition? And how do you get the customer to stop and look at your offerings in the first place? This is where the colored carrot comes into play, along with other niche products. Johnny's strives to lead on niche products with extensive trials, both on-site as well as in our work with collaborators around the country, to select the best and most widely adapted varieties. Johnny's offers not just trialed and proven varieties of carrots, but the information needed for success as well. Carrots are not the most straightforward crop to cultivate, and achieving the full carrot spectrum can take some practice, but the perfect bunch is within reach!